SDCC, Marvel, and DC, me and the “mainstream”. 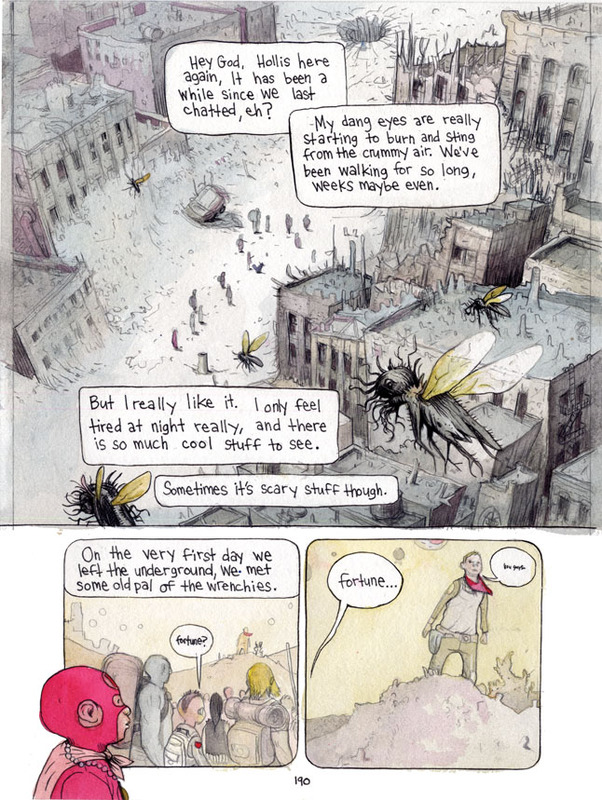 SDCC Original Farel Dalrymple Artwork For Sale from The Beguiling Books & Art. 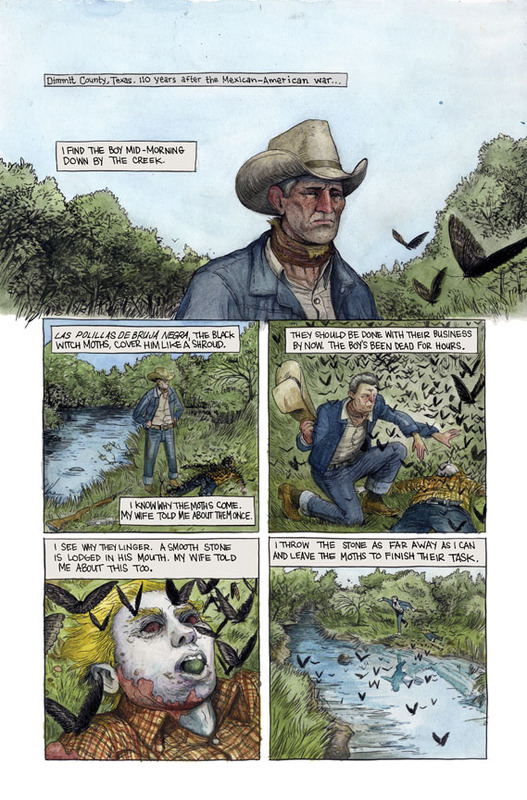 Comic-Con International: San Diego, Booth #1629, July 11-15 – Dozens of new, never-before offered pages by artist Farel Dalrymple. Including new pages from Dalrymple’s work on the series’ Prophet, Fantastic Four, Omega The Unknown, Vice Magazine, and more! Well gosh, another year gone by and again i am missing the san diego comic con. i would like to make it back there someday when i have a legitimate reason for going. i hope all you comic con people are having a blast and not getting overwhelmed by all the media and ill-fitting cos play. as you may tell from the heading of this post i will be there in spirit somewhat since my comic art dealer the wonderful men of the wonderful beguiling store are selling some of my comic pages there this year including a lot of my mainstream superhero type work: prophet issue 24, fantastic four issue 600 pages with jonathan hickman, some more omega: the unknown pages; and my pages from the vertigo anthology, the unexpeted story with joshua dysart. also you can see all the pages by going here and here. This is a spread from my issue of prophet #24 being sold by the beguiling. it’s all cleaned up for print so keep in mind the original has a little more character. I still have an issue to complete. i am nearly there. I don’t want to make a bunch of excuses of why i am not done with that yet. it has been fun drawing it but turning out art fast is something that seems to be getting harder and harder the older i get. I love drawing and painting but more as a means to the end of telling my own stories. I am pretty whiney about doing anything other than exactly what i want at that particular moment but I have been grateful for any decent PAYING comic book or illustration work that comes my way. I feel pretty privileged that anyone asks me to make art for money, and I feel honored and lucky that i have gotten to work with people i respect and admire. i know that is a rare thing for sure. but lately I have been trying to be more diligent in saying no to things that distract me from finishing my book, the wrenchies. i think part of me was trying to prove something to the world while indulging in a childhood fantasy of drawing superheroes, that I could be a real mainstream artist or something like that if i really wanted to. anyway, I started work back up on the wrenchies. by next post i will have some new color pages to show you. 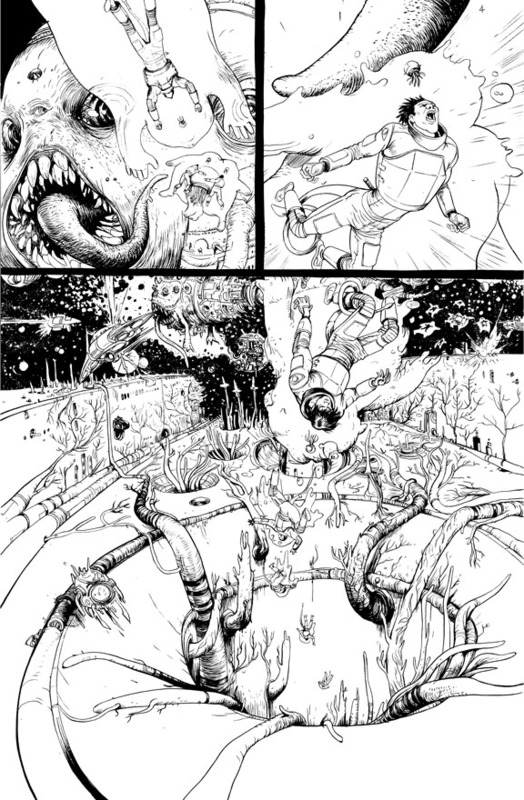 for now here is a page i did too many months ago. i put all the wrenchies pages i have posted so far in their own little set on my flikr if you want to look at all them together. the book is going to be 300 pages now and i got about 90 to go still. my new goal is to have it all done in november. wish me luck. i am also working on one other fun YA project for the fabulous mk reedand greg means. that has been good to go to when the fantasy aspect of my work feels a bit too much. After this year though unless I am offered something that is too much money for me to turn down I am fully devoting myself to working on all my own books. yeah, i try to remind myself of that almost every day. working on my own stories i feel like is getting me closer to the mountain, to parphrase neil gaiman. i got a lot of encouragement from this recent speech he made. That guys is a real pro. his book violent cases with Dave McKean is a big reason i am making comics. ok, that is it for this week. 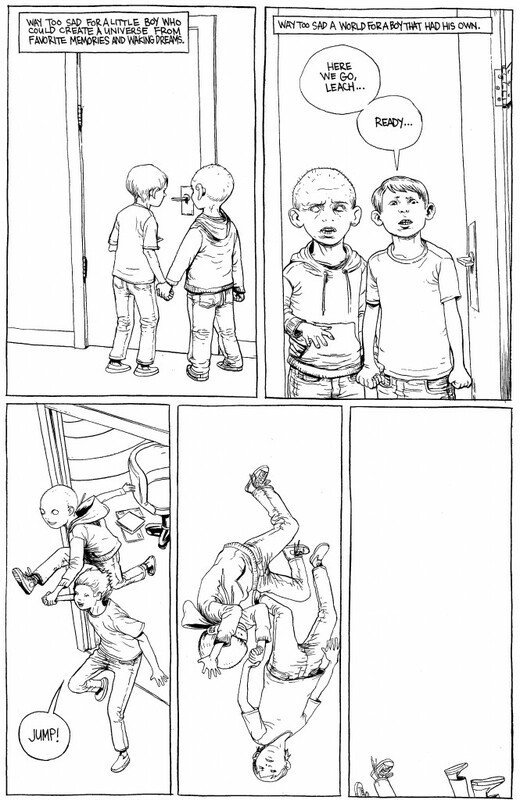 be sure to check out the new it will all hurt pages every friday on studygroup i am uploading pages from that to my etsy frequently so if there is a page you want for cheap, treat yourself. i also made a facebook page for the store too so if you you want to like the page. thanks for checking my stuff out. i will leave you with a recently inked prophet page. have fun in the sun. 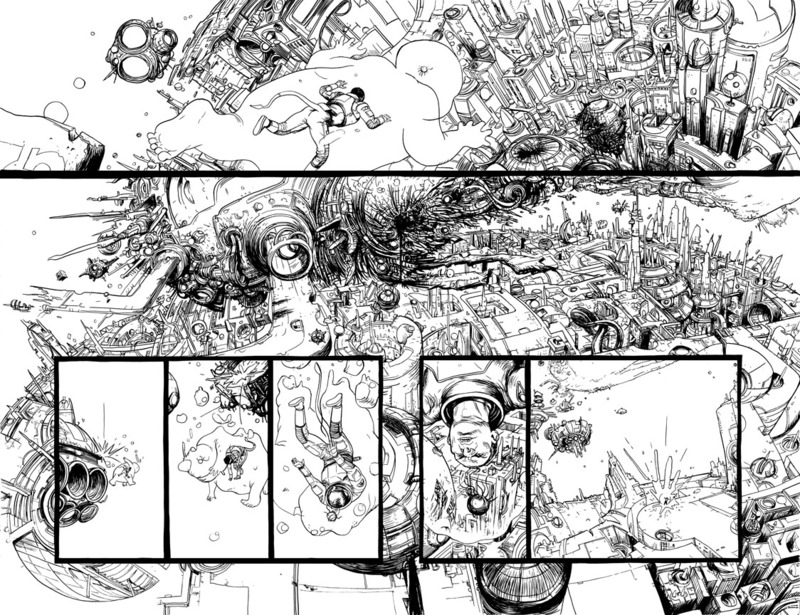 Was the 2 page spread from Prophet #24 sold already? I can’t find any Prophet pages listed on the Beguiling website. hey patrick, i think a couple pages sold but i am not sure which ones yet. the beguiling is still probably trying to catch up from san diego and should have the rest of the pages up on the site soon.